We’d love your help. Let us know what’s wrong with this preview of The Book of Fred by Abby Bardi. Filled with soulful humor and quiet pathos, Abby Bardi's boldly drawn first novel marks the debut of a joyfully talented chronicler of the quest for connection in contemporary life. 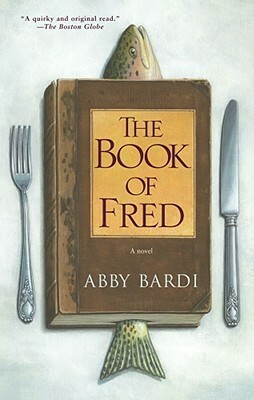 Mary Fred Anderson, raised in an isolated fundamentalist sect whose primary obsessions seem to involve an imminent Apocalypse and the propagation of the name "Fred," is hardly your average fif Filled with soulful humor and quiet pathos, Abby Bardi's boldly drawn first novel marks the debut of a joyfully talented chronicler of the quest for connection in contemporary life. Mary Fred Anderson, raised in an isolated fundamentalist sect whose primary obsessions seem to involve an imminent Apocalypse and the propagation of the name "Fred," is hardly your average fifteen-year-old. She has never watched TV, been to a supermarket, or even read much of anything beyond the inscrutable dogma laid out by the prophet Fred. But this is all before Mary Fred's whole world tilts irrevocably on its axis: before her brothers, Fred and Freddie, take sick and pass on to the place the Reverend Thigpen calls "the World Beyond"; before Mama and Papa are escorted from the Fredian Outpost in police vans; and Mary Fred herself is uprooted and placed in foster care with the Cullison family. It is here, at Alice Cullison's suburban home outside Washington, D.C., where everything really changes -- for all parties involved. Mary Fred's new guardian, Alice, is a large-hearted librarian who, several years after her divorce, can't seem to shake her grief and loneliness. Meanwhile, Alice's daughter Heather, also known as Puffin, buries any hint of her own adolescent loneliness beneath an impenetrable armor of caustic sarcasm, studied apathy, and technicolor hair. And the enigmatic Uncle Roy is Alice's perennially jobless and intensely private brother. As Mary Fred struggles to adjust to the oddities of this alien world, from sordid daytime television and processed food to aromatherapy and transsexuality, she gradually begins to have an unmistakable influence on the lives of her housemates. But when a horrifying act of violence shakes the foundations of Mary Fred's fragile new family, she finds herself forced to confront, painfully, the very nature of the way she was raised. To ask other readers questions about The Book of Fred, please sign up. I was truly surprised by this book. I chose it because I'm teaching a unit on "families" in my critical thinking class and I thought a brainwashed girl from a religious cult moving into a foster home would make for an interesting discussion. I grew so attached to the wonderfully flawed characters that I was ready to throw my book across the room if the author pulled a "My Sister's Keeper" on me. There are five chapters (or "books") told from different points of view. In the first we journey with I was truly surprised by this book. I chose it because I'm teaching a unit on "families" in my critical thinking class and I thought a brainwashed girl from a religious cult moving into a foster home would make for an interesting discussion. I grew so attached to the wonderfully flawed characters that I was ready to throw my book across the room if the author pulled a "My Sister's Keeper" on me. There are five chapters (or "books") told from different points of view. In the first we journey with Mary Fred from "The Outpost" (where her parents have been arrested) to her new foster home. She has never watched TV, never been to a big supermarket, and her parents don't believe in doctors or medicine. She believes there's a big apocalyptic event happening in the near future and that anyone who is not a believer (called Lackers) will burn for eternity afterward. She is, however, nothing but polite and her extreme naivete is endearing. She is torn between her loyalty to her family/religion/beliefs and the wonders of the modern world. The next three chapters are told from her foster mother's, sister's, and uncle's perspectives. And I won't give away what happens in the final chapter (called Revelations). What I love about the way it is written is that it reveals the various wounds each character is carrying and how Mary Fred infects them with something that motivates them to change. Very unexpectedly, Uncle Roy's chapter moved me the most and literally brought tears to my eyes. The book is a slow burn. At first I wasn't sure where it was going, but by the end of the 3rd "book" I couldn't put it down. It was as if Mary Fred's energy had infected me as well. It is a true, if not unusual, "coming of age" story that touches on so many contemporary issues but does not get overly sentimental. 2. A whole lot of crazy went on in this book. But I like crazy. 3. I picked it up because it dealt with cults and that subject fascinates me. I've been reading a lot of non-fiction books about people escaping from cults. 4. I liked how it switched points of view to show the hurt and the healing that the characters went through. 5. I wonder if cult members could really just jump so easily to a new cult when theirs didn't work out. 6. Mary Fred is going to need a lot of counseling from a 1. What the? 6. Mary Fred is going to need a lot of counseling from all the crazy that she's seen in her life. 7. I hope the Littles will be ok.
8. I wonder if Mary Fred will be turned away from all religion from now on. 9. I mean this book is seriously intriguing. I just keep staring off into space thinking about it. 10. I wish there was another cover because the teens at the library (I'm a teen librarian) won't pick it up. I think they would like the book, but the cover doesn't really appeal to the intended audience. 11. I told my husband that if the main character died I was going to throw my book out of the car window. I was that attached to Mary Fred. 12. I also tried explaining this book to him and the words sounded ridiculous. I kept assuring him that it was a great book but I just made it sound even weirder. This review has been hidden because it contains spoilers. To view it, click here. This book was not at all what I expected. With a cover like this, I expected some quirky, loveably odd book about...I don't know...fish? And possibly fish named Fred. Wrong. Believe it or not, this book is about religious cults and the effect they have on people. I know, I know....seriously?! Yes, seriously. Let's just say the jacket illustrator took some of the most random elements in the story and put them together to make a catchy cover...regardless of if is insightful into the storyline. Wha This book was not at all what I expected. With a cover like this, I expected some quirky, loveably odd book about...I don't know...fish? And possibly fish named Fred. Wrong. Believe it or not, this book is about religious cults and the effect they have on people. I know, I know....seriously?! Yes, seriously. Let's just say the jacket illustrator took some of the most random elements in the story and put them together to make a catchy cover...regardless of if is insightful into the storyline. Whatever. The book is about a girl named Mary Fred. Her last name isn't really Fred, but everyone in their cult has to have the name of Fred somewhere in their own name, as it was the name of their founder. The book begins with Mary Fred and her many siblings being taken away from their parents as their parents are incarcerated for neglect after 2 of their children die. All of their children are then put into the foster system. The bulk of the story from this point is about Mary Fred adjusting to life outside a cultic atomosphere, including watching television and shopping for the first time at 14 years old. The family she lives with consists of a sweet woman who works in the library, her daughter who is the same age as Mary Fred, and the mom's drug-addicted brother. The chapters are broken up to be taken from the point of view of each of the different characters, producing a very well-rounded perspective of the events taking place. This is where the real charm of this book is located. Observing the relationships built between Mary Fred and each of the members of the household is both endearing and intriguing as Mary Fred slowly assimilates into the life of a normal 14 year old girl. The end of the book provides some real suspense as Mary Fred's mother is released and attempts to take her to the new cult she has joined, but comes full circle back to the foster home that has officially become Mary Fred's home. In the end, I was surprised by this book. It was far different from what I had expected and raised some good questions about needing to know why we believe what we believe. Raised in a fundamentalist sect, Mary Fred is sent to live with an outside ("Lacker") foster family after her parents are arrested for second-degree murder (Two of their kids died because they didn't provide medical treatment.) It’s not a book that focuses on life within and/or escaping a sect, as The Chosen One does. Rather, it focuses on the characters—mainly Mary Fred as she learns about and adjusts to life “outside,” but also how her presence affects the family she lives with. Each characte Raised in a fundamentalist sect, Mary Fred is sent to live with an outside ("Lacker") foster family after her parents are arrested for second-degree murder (Two of their kids died because they didn't provide medical treatment.) It’s not a book that focuses on life within and/or escaping a sect, as The Chosen One does. Rather, it focuses on the characters—mainly Mary Fred as she learns about and adjusts to life “outside,” but also how her presence affects the family she lives with. Each character gets a turn as narrator, finally coming full-circle back to Mary Fred. The book’s strength is its focus on the characters, rather than their circumstances. Mary Fred’s naiveté is endearing, but that’s not her only attribute: she’s a 15-year-old missing her family, trying to figure out a foster family with its own problems, and starting to question her religion. When the book’s narrators switch—to the foster mom, foster sister, uncle, then finally back to Mary Fred—it gives the characters more depth, and even the initially-annoying characters are more understandable and likable by the end. Now would, realistically, Mary Fred have a harder time participating in her new life? Would she need counseling? Would other characters give her more of a hassle? Maybe. Probably. But the book is less concerned with presenting a strictly realistic version of a teenager leaving a cult, and more with the personal growth and stories of these specific characters. Told in alternating viewpoints, The Book of Fred is a coming-of-age story focused mainly on Mary Fred, moved to a foster home after her cultist parents’ views on modern medicine cause two of her brothers to die of curable illnesses. Since Mary Fred was raised in an isolated compound, focused mainly on the teachings of a prophet named, well, Fred, she’s at first astounded by such things as can openers, daytime television, and clothes in colors other than brown. We follow first Mary Fred, then oth Told in alternating viewpoints, The Book of Fred is a coming-of-age story focused mainly on Mary Fred, moved to a foster home after her cultist parents’ views on modern medicine cause two of her brothers to die of curable illnesses. Since Mary Fred was raised in an isolated compound, focused mainly on the teachings of a prophet named, well, Fred, she’s at first astounded by such things as can openers, daytime television, and clothes in colors other than brown. We follow first Mary Fred, then other members of her foster family. I found this book interesting, but it rarely kept that interest for long periods of time. The concept was interesting but not as well executed as it could have been. I liked the storyline, and the author is good at creating a sense of urgency during “crisis” moments in the book. I felt, however, that the idea of alternating viewpoints wasn’t used to its fullest. For one thing, I didn’t think each character had an individual voice. At times I lost track of who was the focus of a particular section. Also, each viewpoint rarely introduced any new concepts (except for Uncle Roy, whose chapter contains an interesting twist). If you’re not going to introduce anything new, why not just stick with the same character? Mary Fred was the most interesting one, anyway. Also, each of the characters was too mature. Uncle Roy in particular. His voice did not fit his actions whatsoever. I have never cared so much how a book ends and what the outcome will be for the main character. I could not turn the pages fast enough and can therefore only pay the warmest tribute to Abby Bardi for a splendid creation. This is a very moving read both well-written and populated by people who matter to the reader. I will not give away anything of the book as I urge you to simply come to it with a clear head and an open heart. Wonderful! I found this book very enjoyable! I really enjoyed how this story was written in the first person through the eyes of each of the main characters weaving the story together in such a way that you connect with each one individually. The impact the main character has on the lives of the family she is placed with is so heartwarming. Seeing her inner struggles regarding the cult lifestyle she was raised in made my heart hurt and frustrated me, but in the end she endured beautifully. I didn’t know what to expect of The Book of Fred. Having heard it was quite funny, I didn’t expect it to go all too deep when it comes to cults and the like. And so it goes…I starts of on a lighter note – which made me raise an eyebrow. After all, the 15 year old girl is raised in an sect, and just like all her siblings taken away and placed into foster care after her parents put the fate of their sons – who died - in the hand of The One, instead of trusting on (modern) medicine and got arrested I didn’t know what to expect of The Book of Fred. Having heard it was quite funny, I didn’t expect it to go all too deep when it comes to cults and the like. And so it goes…I starts of on a lighter note – which made me raise an eyebrow. After all, the 15 year old girl is raised in an sect, and just like all her siblings taken away and placed into foster care after her parents put the fate of their sons – who died - in the hand of The One, instead of trusting on (modern) medicine and got arrested. That, and her first experiences we learn from the first section The Book of Mary Fred. Then something totally unexpected happened: The Book of Alice. Alice is the foster mom of the middle class family Mary Fred ended up with. She got tricked into it by Diane, the social worker and her friend. And the story continues through her eyes. We get a far bigger share of her feelings, which confirms that, even though she should be there for M.F., she is the one who seems to be in need (too). Soon we roll into The Book of Heather, Alice’s daughter. Puffin - Heather’s nickname, is an ordinary teenager who lacks a certain spark: doesn't like school, doesn't help out at home, basically just hangs in a chair watching **** on TV. With the arrival of Mary, her world is put upside down in a very positive way! She isn't the only one though! Mother and daughter also share the house with Alice’s brother. You could already sense something fishy about him. In The Book of Roy we get to see what’s really behind the funny uncle! I can tell, when the mask fell off, I sat with my mouth wide open. It was from this point on, that I had even more difficulties to put it down. I couldn't stop reading! With Revelations we switch back to Mary Fred and that’s basically all I’m going to say about the last section. The smallest detail, would spoil everything! I compare this book with an old diesel engine... it might take a bit; but once it’s going, it keeps going: an amazing novel with – thanks to changing narrators, well worked out characters and topped with an impressive climax! The Book of Fred was a horrible book to read. I’m not sure what it is that made it bad for me. I don’t recommend it at all. The story is okay but the way it was plotted was horrible. The thing that made it hard to read was it repeated itself TOO MANY TIMES. The story was simple but it took too long to get the new news. The story is a girl’s family is separated because the mom and dad did something, not really known to the reader they mention murder but it doesn’t go too far in detail about it. An The Book of Fred was a horrible book to read. I’m not sure what it is that made it bad for me. I don’t recommend it at all. The story is okay but the way it was plotted was horrible. The thing that made it hard to read was it repeated itself TOO MANY TIMES. The story was simple but it took too long to get the new news. The story is a girl’s family is separated because the mom and dad did something, not really known to the reader they mention murder but it doesn’t go too far in detail about it. Any way her forester family tries to make life easy for her. The first chapter is in the forester girl’s POV. The second chapter is from the mom’s point of view and it is recap of the whole thing and a little more useless knowledge. The next chapter is form the daughter’s POV and then it gets a little interesting because the forester child is hit with a car and put into the hospital at the end of the chapter. Then the uncle has a chapter and he tells the reader he is a drug addict that has formed some respect for the girl. When she was in the hospital he made a saying, “I’ll make a deal with you to make her wake up and I’ll quite with the drugs.” Next day she woke up and she heals a little in the hospital. Back to the forester girl’s POV. A little while in the hospital and they go right back home to where the forester child finds out that she can either stay with the forester home, just the mom, uncle, and daughter, or go “home” with her real mom. She picks her real mom and goes to a new place where she has to have a new life. Finds out their priest has made most of the women pregnant and tried do it to her. She lies her way out and finds out that the whole place she was living was under arrest so she left and went back to her forester family. Uncle is back with a “girlfriend”, reader is not sure who she really is, and they live happily ever after. I really like this book- even more than I expected, actually. 15-year-old Mary Fred is taken into foster care while her parents, members of a religious cult, are tried for the wrongful deaths of her brothers. Having lived on "The Compound" and "The Outpost" all her life, Mary Fred is totally unprepared for the real world. Alice, her foster mother, is a mousy librarian who never got over her divorce from the father of Heather, her blue-haired rebel daughter. Heather also still struggles with her I really like this book- even more than I expected, actually. 15-year-old Mary Fred is taken into foster care while her parents, members of a religious cult, are tried for the wrongful deaths of her brothers. Having lived on "The Compound" and "The Outpost" all her life, Mary Fred is totally unprepared for the real world. Alice, her foster mother, is a mousy librarian who never got over her divorce from the father of Heather, her blue-haired rebel daughter. Heather also still struggles with her parents' divorce and hides behind an angry facade in order to cope. Add Alice's reclusive younger brother, Roy, into the mix and you get a rather unusual foster family for Mary Fred. Because she has never been allowed to watch TV, read books or newspapers, visit restaurants or stores, or wear any color other than brown, Mary Fred is lost in her new world. At first, Alice, Heather, and Roy are too lost in themselves to take much notice. Slowly, however, the four lost individuals come together and form their own family. When tragedy strikes, they slowly begin to come to terms with themselves. When Mary Fred's mother returns from prison and attempts to reclaim Mary Fred into the cult, Mary Fred has to make a life changing decision. I won't include spoilers, but this is not one of those predictable books where you pretty much know the ending from the beginning. It kept me guessing. Set against the backdrop of the doomsday predictions of Y2K, this book is an excellent character study, told in turns through the eyes of Mary Fred, Alice, Heather, and Roy. I was drawn to Mary Fred and her innocence. Bardi has drawn well-rounded characters- human and lovable, yet flawed. I was pleasantly surprised by this book. I highly recommend it. This novel has both an unusual title and an unusual focus: it's the story of a teenage girl removed from a bizarre fundamentalist cult in the late 1990's (during the Y2K scare), who builds a new life with a foster family in suburban Maryland, and as we come to see, that representative run-of-the-mill middle class family has some serious issues of their own. Bardi adopts a technique of letting each of the four main characters relate part of the narrative from her or his own perspective (think Fau This novel has both an unusual title and an unusual focus: it's the story of a teenage girl removed from a bizarre fundamentalist cult in the late 1990's (during the Y2K scare), who builds a new life with a foster family in suburban Maryland, and as we come to see, that representative run-of-the-mill middle class family has some serious issues of their own. Bardi adopts a technique of letting each of the four main characters relate part of the narrative from her or his own perspective (think Faulkner) and she quite effectively made me sympathize and identify with each perspective in turn, which I consider impressive because on the surface I would not think I have all that much in common with most of these folks. Getting us to see below those surface levels of difference and reflect on what needs we share and how our perspectives and back stories ultimately divide us is a noble purpose for any work of literature, and kudos to Bardi for this well written and engaging tale that does just that. Mary Fred, age 15, is removed from her parents care after her brothers die from treatable illnesses. They are part of a cult-like “compound” that believes in prayer over modern medicine. Her foster family consists of Alice, Alice’s brother “Uncle Roy” and Alice’s daughter, Heather, who is also 16. All are initially disconcerted by Mary Fred, her odd religion and her work ethic, but as she eases into the family and begins to experience the outside world, all are changed and improved by the situat Mary Fred, age 15, is removed from her parents care after her brothers die from treatable illnesses. They are part of a cult-like “compound” that believes in prayer over modern medicine. Her foster family consists of Alice, Alice’s brother “Uncle Roy” and Alice’s daughter, Heather, who is also 16. All are initially disconcerted by Mary Fred, her odd religion and her work ethic, but as she eases into the family and begins to experience the outside world, all are changed and improved by the situation. The story is separated into five books, the first four narrated in first person by Mary Fred, Alice, Heather and then Roy. The last is from Mary Fred’s perspective again. Bardi has done a fantastic job giving each of the narrators an individual voice and a different and fascinating point of view on the situation. It also seems as though a lot of thought was given to what portions of the story should be told from which perspective, as Mary Fred’s awakening seems to mirror and enhance what the other family member is discovering about him or herself. The novel is beautifully written, with excellent pacing. For example, more information is revealed to the reader about Mary Fred’s “religion” as she herself reveals it to her new family. Ultimately, the novel becomes more about family than about religion, as each person discovers what the concept means to them and how one knows where one’s true home is. The characters were deep while not being hokey with their positiveness. The perspective of the story changed. Not as much as in As I Lay Dying by William Faulker, but reminiscent. But maybe that's just because I'm a northerner and this book takes place outside of DC and in Virginia and North Carolina and somehow I lump. Also, there was a decent amount of sickness and bedside stuff in this book, so there's similarity there too. Seemingly realistic dealings with both cults and the foster system. I say seemingly because I've never, thankfully, had dealings with either of them (though I might like to be a foster parent someday). The foster kid goes in and changes her family for the better. I like that. Now, they help her too, but it's a different sort of helping. It's amazing when one person can turn a whole family around. I loved this book. The first fifth of the first sentence on the back cover was enough to get me to pick it up from the library shelf. I'm fascinated by all things involving fundamentalist cults and the first bit was about the main character who is removed from her family for reasons relating to the cult they're in. I loved the way the story was told from several different perspectives, adding more depth to the bits you already knew and then continuing on into more detail about that character's s I loved this book. The first fifth of the first sentence on the back cover was enough to get me to pick it up from the library shelf. I'm fascinated by all things involving fundamentalist cults and the first bit was about the main character who is removed from her family for reasons relating to the cult they're in. I loved the way the story was told from several different perspectives, adding more depth to the bits you already knew and then continuing on into more detail about that character's story and background and motivations. Just lovely to read. I didn't want to put it down and I finished it in only a couple of days, which is a rare occurence now that I have a house full of small-medium children. Then! Later in the book, I found out (well, my suspicions were confirmed) that another one of my major interests was involved in the story. Quite well done and enjoyable. Recommends it for: everyone, but be ready...you won't be able to put it down. I didn't know what to think when I picked up this book. I thought it was going to be a lot of cult stuff watered down so that it wouldn't freek people out. I was completely wrong. As you learn about Mary Fred and you see how her foster family adjusts to her, you realize that maybe she isn't the one with all of the drama. From beginning to end, this book is intense. The book starts with the death of her baby brother and Mary Fred (M.F., the nickname for her that makes everyone but her giggle)bein I didn't know what to think when I picked up this book. I thought it was going to be a lot of cult stuff watered down so that it wouldn't freek people out. I was completely wrong. As you learn about Mary Fred and you see how her foster family adjusts to her, you realize that maybe she isn't the one with all of the drama. From beginning to end, this book is intense. The book starts with the death of her baby brother and Mary Fred (M.F., the nickname for her that makes everyone but her giggle)being taken to foster care. That introduction is intense enough to make you think "there lies the plot" but truly there is so much more. Baldi writes in comfortable and accurate first person, switching narrators at crucial breaking points in the book. She does particularly well with the teenage narration, and creates suspense by using the characters' insecurities to help drive the plot. I bought this book either because, well, there is a fish and the fish is connected to the name Fred, and that all ties into one of the oldest inside jokes in my brain. And because the author has "Bard" in her name. Or maybe it was a present. Again with the goofy book choices. This is another in the accidental local-author series. It's a teen novel, essentially, and a nice little snack. The main character, a girl named Mary Fred, is taken from her parents and placed in a foster home because her f I bought this book either because, well, there is a fish and the fish is connected to the name Fred, and that all ties into one of the oldest inside jokes in my brain. And because the author has "Bard" in her name. Or maybe it was a present. Again with the goofy book choices. This is another in the accidental local-author series. It's a teen novel, essentially, and a nice little snack. The main character, a girl named Mary Fred, is taken from her parents and placed in a foster home because her folks have gotten wrapped up in a doomsday cult and charged with neglect for allowing their kids to go without medical treatment. Fred ends up helping her foster family overcome some of their own problems and begins to understand the world she has been so sheltered from. I found this book to be an interesting delight. Bardi does an excellent job of drawing us into the world of the four main characters by changing point of view throughout the novel. The character Mary Fred is the most unique as she was raised in an isolated fundamentalist sect, obsessed with an Apocalypse that she’s sure will soon occur. Her whole world flips upside down when her brothers pass away and her parents are taken away by the police. She starts a new life with a foster family and the ef I found this book to be an interesting delight. Bardi does an excellent job of drawing us into the world of the four main characters by changing point of view throughout the novel. The character Mary Fred is the most unique as she was raised in an isolated fundamentalist sect, obsessed with an Apocalypse that she’s sure will soon occur. Her whole world flips upside down when her brothers pass away and her parents are taken away by the police. She starts a new life with a foster family and the effects of this are emotionally moving. Both Mary Fred’s new family and her struggle to coexist but eventually end up changing one another’s lives. Bardi eloquently depicts all the characters journey of discovery and truth. I particularly found Mary Fred’s to be the most profound as she discovers the truth about the life and dogma she was blinded with for so long. Told in five "books", like books of the Bible, we learn the story of Mary Fred, who has been raised in a Kareshian type cult/fundy Christian organization and she's never been allowed to go to school and has to wear the color brown a lot. After two of her siblings die because her parents refuse to seek medical treatment, Mary Fred is taken from her parents and placed with a foster family with troubles of their own. How Mary Fred's goodness and innocence change her foster family for the better mak Told in five "books", like books of the Bible, we learn the story of Mary Fred, who has been raised in a Kareshian type cult/fundy Christian organization and she's never been allowed to go to school and has to wear the color brown a lot. After two of her siblings die because her parents refuse to seek medical treatment, Mary Fred is taken from her parents and placed with a foster family with troubles of their own. How Mary Fred's goodness and innocence change her foster family for the better makes this an endearing read without being syrupy. This probably could have been an even better book if each of the five books hadn't had to move the story forward and simply allowed each character to develop, but that's not how Bardi chose to structure the book. Mary Fred is a teenager who lives with her family on a commune as part of a religious cult who follows a man named Fred Brown, who wrote their religious text, “The Book of Fred”. Two of her younger brothers - Fred and Freddie - die of curable illnesses, and her family is taken into custody: her parents by the prison authorities, and she and her siblings by social services. The Book of Fred chronicles Mary Fred’s time with her foster family, including the changes she makes within herself and in h Mary Fred is a teenager who lives with her family on a commune as part of a religious cult who follows a man named Fred Brown, who wrote their religious text, “The Book of Fred”. Two of her younger brothers - Fred and Freddie - die of curable illnesses, and her family is taken into custody: her parents by the prison authorities, and she and her siblings by social services. The Book of Fred chronicles Mary Fred’s time with her foster family, including the changes she makes within herself and in her new household. I started reading this book and the further I got, the more I didn't like it. It seemed repetative and dragged on. It is about a teenage girl who is removed from her parent's home, really a compound in a cult, and put into foster care. Her parents have allowed her two younger brothers to die because they did not believe in taking them to a doctor. So, Mary Fred comes into this home where Heather is a teenager, spoiled rotten by her mother, an unemployed, out of touch uncle and a mother who is a I started reading this book and the further I got, the more I didn't like it. It seemed repetative and dragged on. It is about a teenage girl who is removed from her parent's home, really a compound in a cult, and put into foster care. Her parents have allowed her two younger brothers to die because they did not believe in taking them to a doctor. So, Mary Fred comes into this home where Heather is a teenager, spoiled rotten by her mother, an unemployed, out of touch uncle and a mother who is a kind soul, trying to help out by taking Mary Fred in. Things are all new and strange to M.F. but she adjusts and makes everyone better human beings because of who she is. Abby Bardi is the author of THE BOOK OF FRED, THE SECRET LETTERS, and DOUBLE TAKE. She grew up in Chicago, went to college in California, then spent a decade teaching English in Japan and England. She currently teaches at a college in Maryland and lives in historic Ellicott City with her husband and dog.